The series of heavy snowfalls here in the Northeast has significantly narrowed many neighborhood streets. The one-way street at right, normally 30 feet curb-to-curb, with parking on the left side only, has been hemmed in by five feet on both sides after repeated plowings. 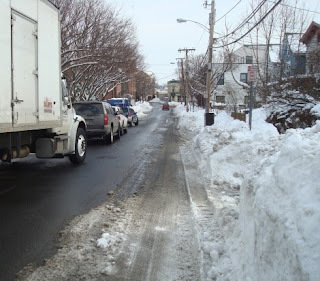 Faced with exceptional quantities of snow and limited resources, the city workers removed only as much as was necessary to permit cars to park on the left, while allowing free passage to the right. For once, the width of the street has been determined by an economically-efficient allocation of space, rather than the dictates of the town zoning code. The results of this involuntary street narrowing have been immediately noticeable. Traffic, which previously raced down the 20-foot right of way at speeds in excess of 40 mph, now proceeds at 20 mph or less. (Incidentally, a pedestrian's chance of surviving a collision with a car moving at 20 mph is 95 percent, as compared to 10 percent for the same car going 40 mph.) Yet the parking capacity of the street is virtually the same as before, and it remains fully accessible to emergency vehicles. Very few municipalities would permit the construction of a new street this narrow (and in fact the street in the picture, laid out in the late 1800s, has been widened considerably). The snow this winter, however, has given Northeast residents a revealing look at how a substantial street narrowing would play out in practice. Narrow streets! I'm sure you've heard of this proponent of narrow streets? Fantastic! Thanks a lot for the link.